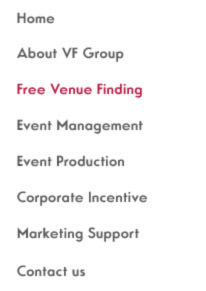 VF Group provide a FREE UK International Corporate Hotel, Conference Management and Venue Finding service. One call WILL save you and your organisation time and money, leaving you to get on with your job. Every successful company needs an efficient administrative operation in today's competitive business environment. Now you can avoid the fuss of arranging the booking of meetings, conferences or accommodation anywhere in the world. The venue sourcing team at VF Group are extremely efficient and very experienced, committed to providing a highly personalised and valuable range of services. We aim to build strong relationships with our clients, understanding their needs, responding quickly with fully priced and clear proposals, for all meeting and event requirements. We always remain totally transparent in all our dealings, keeping the client fully informed at all times. Negotiating very competitive rates and able to provide the required flexibility in cancelling venues at short notice, sometimes without incurring cost. Providing you confidence from start to finish whatever your event may be !!! We utilise a huge database of conference and event venues throughout the world which includes!!! Since working with Venue find, we have found that our detailed schedule of assessment centres has run very smoothly. Once our schedule is communicated to Venuefind, we are always confident that the bookings have been made efficiently. In addition to this effective service, the team will often go beyond there remit by requesting feedback from us after an event has been taken place…. Such information is then used to recommend various hotels to her other clients. I have been using Venue find since 2001… attention to detail and the level of service required by ourselves are always met and exceeded by the team of Venue find. The speed from initial booking request to confirmation being relayed back to us is rarely more than 24 hours…..On occasions our preferred venue is not available an alternative within budget is always provided….the quality of service we receive, and the level of efficiency and cost benefits we gain booking from Venuefind are significant, I would not hesitate in recommending the team to other corporate clients.